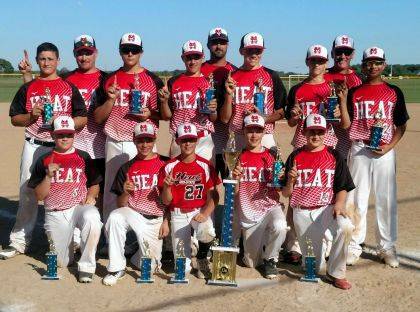 The Mid-State Heat 13U travel baseball team won the Marysville Mitts Dean Lowery Memorial Tournament over the June 2-3 weekend. The team went 5-0 and beat 3 Elite Level teams from the Columbus Area. The team consists of athletes from Benjamin Logan, Indian Lake, Riverside, Marysville and Graham. Front row: Trey Miracle, Simon Godwin, Riley Neer, Chase Adkins, Luke McKenrick. Middle row: Ben Sells, Grady Algire, Gavin Lones, Sam Ludlow, Kameron Allen, Ian Scheiderer. Back row (Coaches): J.D. Miracle, Andy Algire, Chris McKenrick.